The Locust Swarm emerges from the steppes of the Ru Darklands and calls upon the unholy forces of the Ynfernael to aide in their conquest. The demonic flesh rippers, shrieking berserkers, and monstrous spine threshers take to the battlefields of Terrinoth to unleash their vengeance against the peoples who forced them to the edge of extinction all those ages ago. 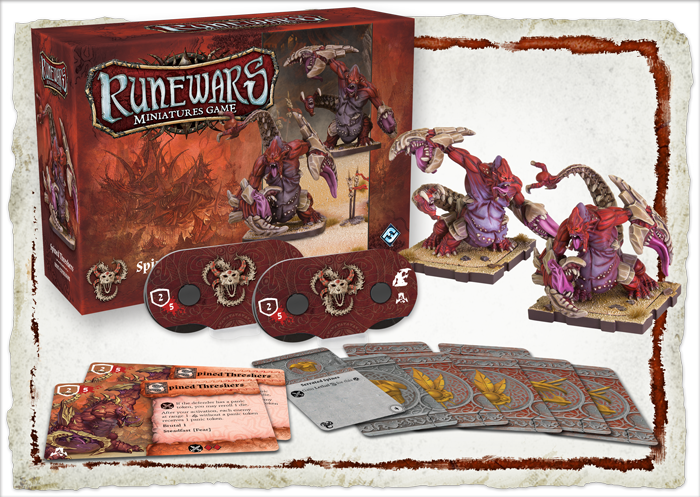 Fantasy Flight Games is pleased to announce three new unit expansions for the Uthuk Y’llan of Runewars Miniatures Game! Players can now expand forces with unique unpainted miniatures, upgrade cards, and tokens for the Flesh Rippers Unit Expansion, Berserkers Unit Expansion, and Spined Threshers Unit Expansion! To the armies of the Uthuk, flesh rippers have many purposes. Although unruly, the Uthuk know how to use these creatures as everything from shock troops to hunting hounds, from scouts to saboteurs. Directed by their handlers or by the mind-speech of the blood witches, these ravenous demons can assault enemy lines or harass supply trains, moving swiftly to outflank any attempts at flight, and tearing into those who stand their foolish ground. Further, when sent to hunt or scout, no cunning woodcraft or careful stealth can hide the scent of flesh and blood from the beasts. 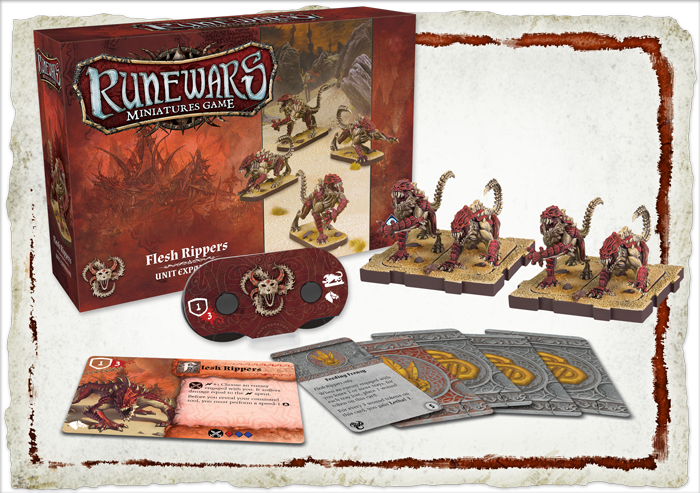 The Flesh Rippers Unit Expansion includes four plastic figures and two movement trays to house them, as well as a collection of tokens and five upgrade cards. Of these, one upgrade whips the player’s demons into a Feeding Frenzy. 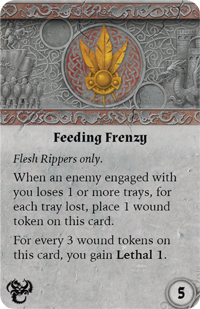 This states that when an enemy engaged in combat with the flesh rippers loses one tray or more, the player commanding the flesh rippers places a wound token on the upgrade. The flesh rippers subsequently gain Lethal 1 for every three wound tokens on the card. As the taste of blood throws the demons to the edge of madness, they become more erratic and more deadly to both the mortals who face them and the locusts who try to control them. for their lack of formal training. Simply surviving the Ru Darklands exceeds the rigor of even the most disciplined of Daqan Lord’s marshalling grounds. The only way the berserkers survive in these unforgiving lands is to become fiercer than the perils set against them, and so they learn to hunt, fight, and kill almost as soon as they can walk. Most of the berserkers’ weapons are crafted from the bones and of the beasts they slay and, while Daqan infantry might scoff at the sight of a bone club in the hands of a berserker, the bones of the Ynfernael demons the berserkers had to have bested are sufficient enough to crush helms and pierce mail. 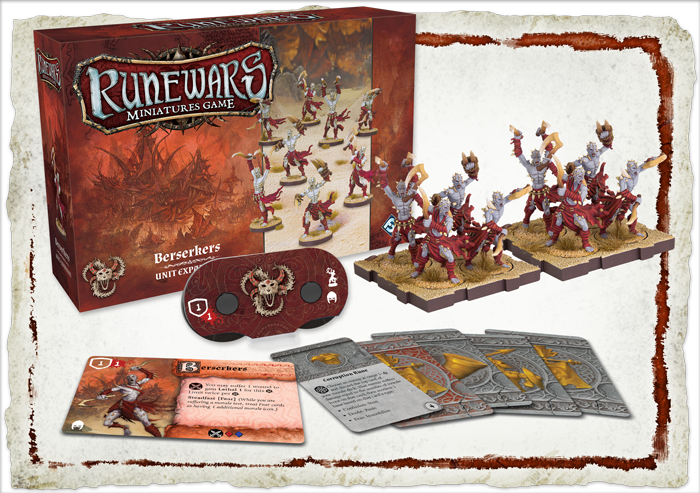 The Berserkers Unit Expansion offers players a full unit of eight berserker miniatures and two movement trays, one unit card and command tool, five upgrade cards, and six tokens. Of these upgrade cards, each increases the lethality of your berserkers. Bloodrage Conduit allows the berserkers to exhaust as many of that card they would like during a melee to gain Lethal 1 for each card spent. 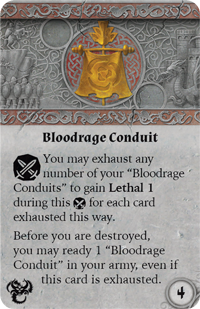 Beyond this, the card also allows the user to ready any Bloodrage Conduit in their army before their unit is destroyed, even if the card has been exhausted. A player controlling the mindless killers may choose to stockpile these upgrades to launch an assault upon their unsuspecting enemies. A single berserker may not strike fear into the hearts of the Daqan, but the swarm is unstoppable. A single spined thresher summoned from the Ynfernael is powerful enough to tear apart a barricade, decimate a village, or consume an unlucky patrol. In groups, these demons can withstand the charges of armored knights and tear down castle walls with ease. Among their only weaknesses are their unruly natures and the great difficulty and cost of the rituals used to summon them. However, as the Uthuk return to the lands of their ancient enemies, the difficulty of acquiring blood for the sacrifices lessens with each town razed or keep sacked, so more threshers are brought into the mortal realm to continue their gruesome harvest. The Spined Threshers Unit Expansion comes with two unpainted figures, unit cards, movement trays, command tools, twelve tokens, and eight upgrade cards. Among these, hungry Uthuk generals will find the Frontline Spined Thresher, which feeds on the fear of its enemies in battle. 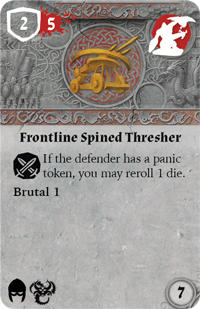 Its upgrade card not only adds a Brutal 1 keyword to the beast, it also allows the spined thresher to reroll one die during a melee if the defender has a panic token. The mortals of Terrinoth may believe themselves to be brave, but a single encounter with a spined thresher will prove how foolish and weak they are. As the Uthuk take the battlefield, their forces grow with each drop of blood they shed. Summon the forces of the Ynfernael and conquer Terrinoth with your unparalleled strength! Look for the Flesh Rippers Unit Expansion (RWM26), Berserkers Unit Expansion (RWM28), and Spined Threshers Unit Expansion (RWM30) in Q4 of 2017!